Whilst not all lifestyle product collaborations make a great deal of sense, this one most certainly does. Wahl (UK) Ltd, in collaboration with Kent Brushes have created an exclusive, hand-made barber comb. 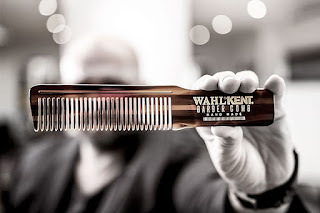 These combs are limited edition, only 1000 have been made. Between them the brands have some 300+ years experience with strong reputations around the World for their quality and craftsmanship. The combs are completely handmade using sheet acetate. The comb shape is cut by hand on a jig and then every tooth is hand cut and polished, this means there is no mould line which can scratch and damage the hair follicles. This exceptional attention to detail cannot be replicated by a moulded plastic comb. You are well within your rights to question why you should listen to a bald man about combs, but consider this. I carry around a Stussy Deluxe x Kent pocket comb at all times, I'm a purveyor of fine quality products, and importantly I have trusted and reliable insider information. This makes for an extraordinary and most likely unexpected gift for the hirsute man, whether that's yourself or a friend. It even fits within the average Secret Santa budget which is quite frankly astonishing for something made in such limited numbers and leaves you with no excuses. Get one HERE before they are gone.